US, 1992, 98 minutes, Colour. Louis Gosset Jnr, Rachel Mc Lish, Paul Freeman, Christopher Cazenove, Fred Dalton Thompson, Mitchell Ryan. 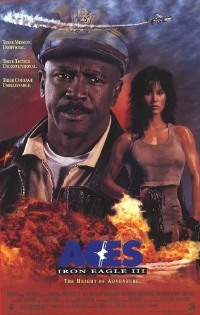 Aces: Iron Eagle 3 has Louis Gossett returning in his role of Sinclair, the air ace and trainer. The action of Iron Eagle centred on the Mediterranean with echoes of the bombing of Libya. Iron Eagle 2 transferred the action to Afghanistan and the East. This time the action focuses, as with so many action films of the '90s (Firebird, McBain?, Toy Soldiers) on the drug cartels of Colombia. The cartels became the cinema target of so much American patriotism in the early '90s. The film is entertaining, gung-ho and macho. It was directed by action director, John Glenn (director of several of the James Bond films). The film has a stronger cast than usual with Christopher Cazenove and Horst Buchholtz as air aces, Mitchell Ryan as the villainous general, Fred Dalton Thompson as a businessman and perennial villain, Paul Freeman (Raiders of the Lost Ark, Just Like a Woman) as the German drug dealer. The film focuses on the air aces, the closing down of American bases in the '90s, the war on the drug lords. 1. Entertaining action drama? Gung-ho style? Vietnam background? The air aces and their demonstrations? The closing of American bases, the drug wars? 2. American and South American settings? Musical score? Stunts and action work? 3. The title and the focus on the veterans? Their past history? Their performing demonstrations? Their desire to be in action again? 4. Louis Gossett and his style, Sinclair, the demonstrations? His pals? The closing down of the base? His relationship with the general? The plane shot down and the dead pilot accused of being a drug-runner? His sister coming to Texas? Wanting to uncover the truth? The attacks on the sister and her family? His persuading his pals to join in the action? The wealthy businessman? Equipping the planes, taking the weapons from the base? The plan, the technology? Going to South America, the flights? The dangers and the attacks? Getting in, on the ground, the battles, the explosions, the destruction of the laboratory, the pursuit of the villains? Mission accomplished? 5. Christopher Cazenove as the British flier, his background, personal style, involvement, the fight, surviving? The German, the war memories? The medal? The family background, the memories, the confrontation with Krais? The Japanese air ace, his having to confess that he was a fraud, his involvement, his death? 6. The military personnel, the general and the closing down of the base, his resentment against authority, his decision to be involved in drug-running? His young assistant? The concealing of the drugs in the planes? The clue of Jackhammer? The confrontation with Sinclair? Going to South America, the final fight and his death? 7. The pilot's sister and her coming to America, the threats? The black youth who saved her? Working with Sinclair, the return to her country? Participation in the fight? The young man and his involvement, stowing away? Injuries? 8. The businessman, his backing of the aces? His own involvement? 9. Krais and the laboratories, the planes, the drug rings? Communication and money? His vicious henchmen? The final pursuit, the confrontation with the German air ace? His death? 10. Traditional American action material? The background of drugs and the fight against the Colombians in the '90s?